With permission, The Beacon is archiving past issues of Matthews News & Record (also called Matthews Record and The Matthews News) articles online. Throwback Thursday articles will include relevant content still facing Matthews today. This story was originally published January 26, 2006 and was written by News & Record staff. At their annual recognition dinner on January 13, members of the Idlewild Volunteer Fire Department recognized Tommy Rogers who is stepping down as the department’s fire chief. Rogers has served as chief for eight years and as assistant chief for 19 years prior to that. He joined the department in 1975, shortly after it was organized. During Rogers’ tenure as cheif, the department added two new vehicles, completed a major addition and renovation to the fire station, and added paid employees to the roster for the first time to supplement the volunteer staff during the daytime hours. 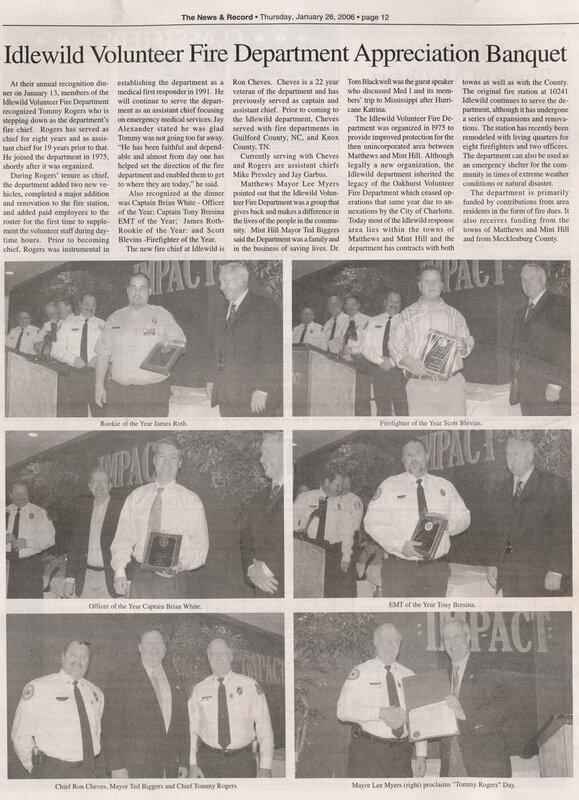 Prior to becoming chief, Rogers was instrumental in establishing the department as a medical first responder in 1991. He will continue to serve the department as an assistant chief focusing on emergency medical services. Jay Alexander stated hew was glad Tommy was not going too far away. “He has been faithful and dependable and almost from day one has helped set the direction of the fire department and enabled them to get to where they are today,” he said. Also recognized at the dinner was Captain Brian White - Officer of the Year; Captain Tony Bresina - EMT of the year; and Scott Blevins - Firefighter of the Year. The new fire chief at Idlewild is Ron Cheves. Cheves is a 22 year veteran of the department and has previously served as captain and assistant chief. Prior to coming to the Idlewild department, Cheves served with fire departments in Guilford County, NC and Knox County, TN. Currently serving with Cheves and Rogers are assistant chiefs Mike Pressley and Jay Garbus. Matthews Mayor Lee Myers pointed out the Idlewild Volunteer Fire Department was a group that gives back and makes a difference in the lives of the people in the community. Mint Hill Mayor Ted Biggers said the Department was a family in the business of saving lives. Dr. Tom Blackwell was the guest speaker who discussed Med 1 and it’s members’ trip to Mississippi after Hurricane Katrina. The Idlewild Volunteer Fire Department was organized in 1975 to provide improved protection for the then unincorporated area between Matthews and Mint Hill. Although legally a new organization, the Idlewild department inherited the legacy of the Oakhurst Volunteer Fire Department, which ceased operations that same year due to annexations by the City of Charlotte. Today most of the Idlewild response area lies within the towns of Matthews and Mint Hill and the department has contracts with both towns as well as the County. The original fire station at 10241 Idlewild continues to serve the department, although it has undergone a series of expansions and renovations. The station has recently been remodeled with living quarters for eight fire fighters and two officers. The department can also be used as an emergency shelter for the community in times of extreme weather conditions or natural disaster. The department is primarily funded by contributions from area residents in the form of fire dues. It also receives funding from the towns of Matthews and Mint Hill and from Mecklenburg County. Interested in advertising? We have special rates for investors who believe in what we’re doing. We have writers and photographers ready but we need your monetary support.